On Tuesday 10th May a Texas Rat Snake was found basking on the grass near the mens bowls pavilion. This three foot-long reptile was worrying the dog walkers and passers-by. With the help of the PCSO, the snake was captured and taken to the RSPCA. The Texas Rat Snake is not a native species and it is thought that some careless owner is probably searching under the bed for it. 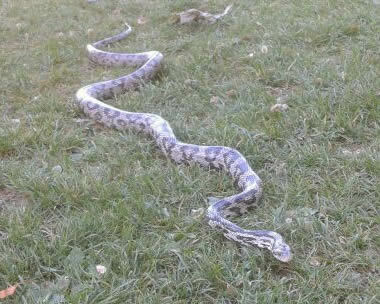 Lets hope the snake is well looked after and not spotted again in the park. Photo courtesy of Darren Larbey, City Parks. Report of the snake was made to myself (Andy Jeavons) and both Darren Larbey and myself kept hold of the beast until taken to the RSPCA in Patcham by the police. The Booth natural history museum in Dyke Road identified it as a Texan rat snake whilst the RSPCA said it was a corn snake. Personally, i don’t think it was either although the rat snake was most likely out of the two.